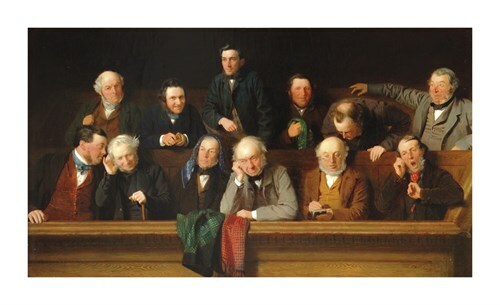 The Jury was painted by John Morgan in 1861 at the Assizes held at County Hall, Market Square, Aylesbury. This expressive and witty painting depicts 12 local figures sitting as a jury, who are all listed in a plaque beneath the painting which gives their surname and occupation. Many of the names, such as Ivatts and Horwood, are long standing local names and information about sitters can be found in the census, newspapers and trade directories of the time. The picture was first displayed in the spring of 1862 in an exhibition held at the British Institution, London. On 15 February 1862 The Bucks Advertiser recorded that The Jury in the exhibition 'has been placed in the most advantageous situation, and is noticed in the most laudatory terms by all the daily journals. All who saw the work will congratulate our townsman on a success which has been earned by none of the tricks or vulgarities of art, but the keen eye for and strict fidelity to nature, of which the picture bears such evident marks'. The popular appeal of the painting was soon realized and in 1863 a mezzotint engraving of the painting by W Joseph Edwards was published by Henry Graves and Co. It was the first of Morgan’s paintings to be engraved as a print and because of his habit of signing his works J Morgan it earned him the title of ‘Jury’ Morgan. John Morgan was born in Pentonville, London in 1822. After spending time as an apprentice to a business which designed frames and furniture for Gillow, Jackson and Graham, he studied at the School of Design at Somerset House, before a period in Paris as a pupil of Thomas Couture and Paul Delaroche. Morgan moved to Aylesbury at some point in the 1850s, and is described in the 1861 census as an “artist subject painter in oils”. His time in Aylesbury was most productive, and he produced at least three paintings depicting local scenes, including The Jury and The Country Auction. Morgan suffered from respiratory problems, and spent much of the late 1860s looking for a home that would ease his condition. He eventually settled on Guildford; while his chest continued to trouble him, he continued to achieve success in his career, exhibiting regularly at the Royal Academy, the British Institution and the Society for British Artists, of which he was elected a member in 1875. In 1882 Morgan moved again to Hastings, where he died in 1885. His studio sale was held at Christie’s on 1 March 1887.